You’re quickly becoming a name to know for abstract works, figures, and more. How long have you been in the art industry? Since I can remember I have been painting and drawing. I was in honors art in high school, and that is where I learned a lot of technique and developed a passion for art history. In college I started doing commission work for those who knew I painted, but it still took me a few years to develop confidence in my work and really get out there. I was expecting my daughter in 2016, and the timing couldn’t have been more perfect to go full time as an artist. 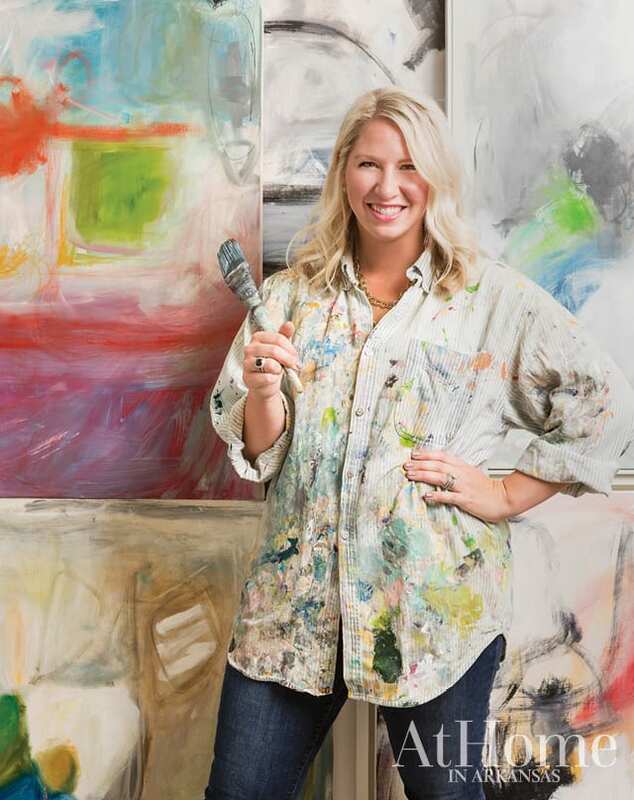 My husband, Brock, and I took the leap of faith, and I started Allison Hobbs Art, LLC that November. So, did you have another career before this was your full-time venture? Yes, I was previously in advertising and sales; I worked with the fabulous family over at KNWA, our local NBC news station. I loved my role there, but it obviously was not what the Lord had planned for me long term. I definitely learned a lot in that position and adapted it into marketing for my art business. You have a range of subjects from abstracts to faces and figures. Do you have a favorite? It’s hard to have a favorite! I think it is whatever I am enjoying at the moment. Right now, I’m in an abstract phase and working on different techniques and trying to stretch my color palette. We see you’re also creating pillows. What inspired you to take your art to textiles? I was actually searching for fabric to recover a chair and wanted an abstract play on a specific pattern. I came across one that I fell in love with and said, “Why can’t I do this myself?” I kept seeing this art-in-fabric movement evolve in the interior design world, so I researched the process of how to transfer my art onto fabric. It’s been a huge learning curve for me, but I have enjoyed seeing the fabric come to life. Each textile comes from an original painting by me. I take an image of part of a painting, and I work it into a pattern on the computer. Then I send it off to have it printed on fabric and have the pillows made. How can people find your work or shop for pieces? I post all my new work on my Instagram page (@allisonhobbsart), and my pieces are for sale on my website (allisonhobbsart.com). I also work with designers and have some work in interior design and home stores in Little Rock and Memphis—which is my hometown. If you want to see pieces in person, you can find a list of those retailers on my website. Your daughter, Sutton Faye, seems to be right at home in your studio. She is! Having a daughter and watching the world through her eyes has changed my perspective on a lot, and I am seeing this play out in my work in use of color and in risk. I am constantly teaching her new things and letting her go crazy in paint or color. 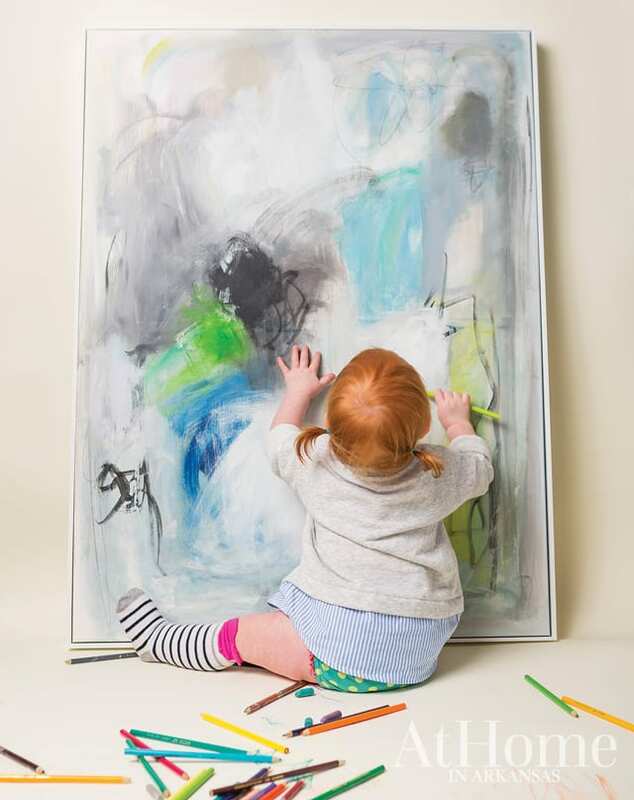 Talk about inspiration: Put your toddler behind a paintbrush and watch how free she is. It is my ultimate goal to leave a legacy, not only of amazing work, but of courage. I want to create a pathway for her and other artists, to let them know that with faith, a good support system, love, and hard work, you really can do anything you set your mind to do. Is there anything on the horizon for Allison Hobbs Art that At Home readers should keep on their radar? We do have some very exciting news coming soon concerning an actual space where you will be able to come and get your contemporary art fix. I will leave it at that for now, but stay tuned for more details.